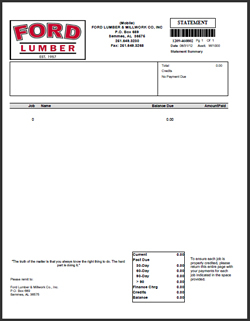 Charge Accounts | Ford Lumber & Millwork Company, Inc. Individual and corporate charge accounts not only make ordering supplies more efficient, they also make it easier to track how your money is being spent. We provide Statements of Account (itemized by job upon request) at the end of each month with itemized invoices detailing each transaction, and payments are due on the 10th day of the month. And, as a charge account customer, you may access your account information through our website by clicking on My Account. Please call us at 251.649.3230 (option 5) for additional information, or you may request a credit application here. Thank you.